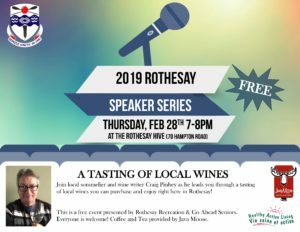 Join local sommelier and wine writer Craig Pinhey as he leads you through a tasting of local wines you can purchase and enjoy right here in Rothesay! This is a free event presented by Rothesay Recreation & Go Ahead Seniors. Everyone is welcome! Coffee and Tea provided by Java Moose. Rothesay in partnership with Go Ahead Seniors present the 2019 Winter Speaker Series. These speaker sessions will take place every Thursday evening in February and March from 7-8pm at the Rothesay HIVE (70 Hampton Road). All of these events are free to the public and no registration is required. Java Moose will be providing tea and coffee for each speaker session. For more information call 847-6398. Copyright © 2019 Rothesay. All Rights Reserved.